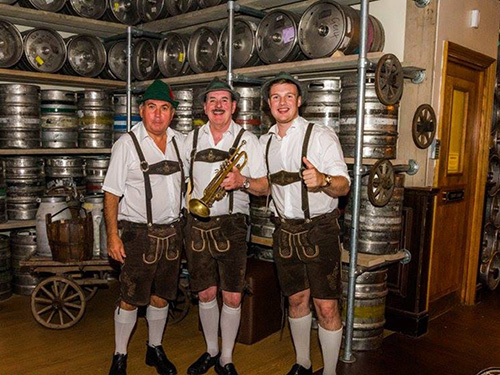 The Cardiff Oompah Band are a musically gifted and enthusiastic group of musicians who recreate the thigh-slapping magic and energy of the Hoffbrauhaus! Formed over thirty years ago by some of this country’s most versatile players, the Cardiff Oompah Band regularly performs to audiences of all sizes and at venues all over the UK, entertaining and thrilling audiences of all ages. Since its inception in the 1980s, the band have been no strangers to the media. They frequently appear on the radio and television and have also performed at every conceivable type of venue from Butlins and Pontins Camps, countless Army, Navy and RAF bases, to Bierkellers, theatres, restaurants, village halls, clubs and hotels. The Cardiff Oompah Band are also the resident band for the famous ‘bierfestuk’ events held across the country, from Cardiff to London and Edinburgh to Penzance. This band can also be heard performing for students at the Royal Welsh College of Music and Drama, Cardiff University, the University of South Wales, Aberystwyth University and many more. 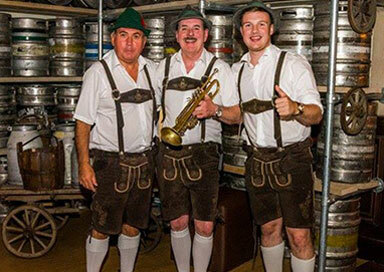 The Cardiff Oompah Band are fluent in a wide array of Bavarian music, including the finest German marches, timeless waltzes, polkas and modern sing-a-long songs in the Bavarian Oompah Band style. 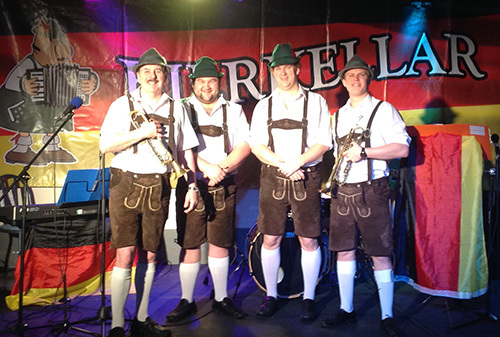 Put simply, they are one of the most entertaining and exciting Bavarian Oompah Bands who excel at recreating the atmosphere of the Oktoberfest at its best.